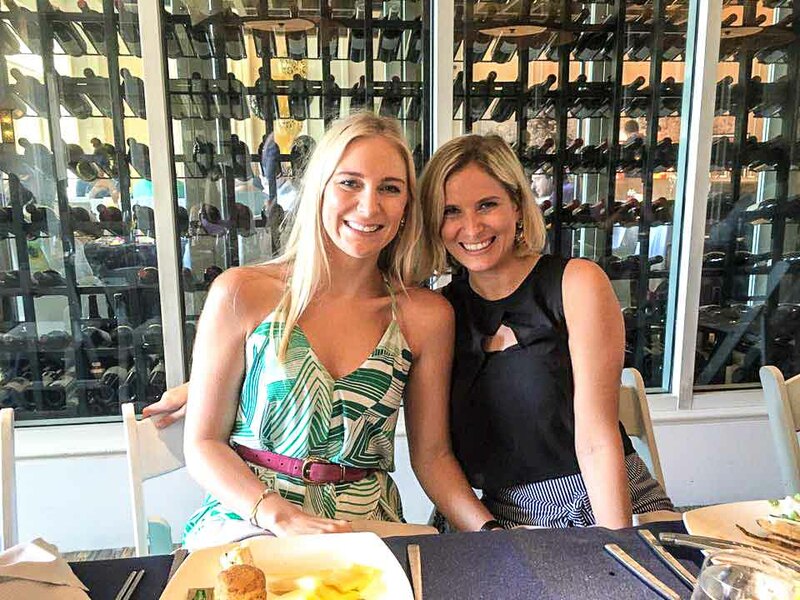 A couple of weeks ago the team at the Ritz Carlton Grand Cayman very kindly invited Stefan and I to enjoy brunch at Seven Restaurant to celebrate our two year wedding anniversary! With no celebratory plans, it was such a genuine surprise and an incredible gesture from the Ritz team! Although not our first brunch at the Ritz, we typically save this $95 luxury brunch experience for Christmas or very special occasions. Given this, it was a real treat to be guests of the Ritz to celebrate two years of marriage - something we really ought to celebrate! Brunch at Seven starts at 12:00 noon but to ease you through the doors and welcome you to the Ritz Carlton level of service, there is a welcome cocktail to be enjoyed at the entrance of the restaurant. For us the offer was a fresh, bloody mary cocktail made to order and topped with a fresh stick of celery. Although I'm not partial to tomato juice cocktails (don't even get me started on "clamato" juice! ), it made for a nice pre-cursor to brunch and a chance to mingle and catch up with other brunch go-ers. As locals, there will ALWAYS be someone you know at brunch, and I really love that unexpected catch up...maybe the free-flowing champagne helps! Once you are through the doors, the grand ceilings and heavy woods lets you know you've arrived to luxury. Glass partitions filled with vast collections of wine and a wall of windows over looking the pool, beach and sea, the setting is one of a kind. Five star luxury meets paradise in a beautiful setting for groups or couples. We enjoyed a table for two right at the window, overlooking the outdoor patio and pool area which was busy with diners and holiday makers. For brunch there is the option to eat outside and there are fans and shaded seating for those wanting the island experience. I personally find it too hot to truly get my monies worth so prefer to sit inside to sip my champagne in the cool of the air conditioning (spoken like a true Caymanian!). If you're brunching with a group, be sure to request the middle tables inside amidst the wine cellars. These are quite possibly the best seats as it feels private yet spacious for your and your gang (as pictured below with bestie Harriet!). Being spoilt with brunch options in Cayman, my focus has turned to quality over quantity in recent years. That goes for frequency of brunch and food consumed! At Seven, this way of dining really rings true. I tried caviar for the first time, enjoyed fresh oysters, a raw bar of shrimp, crab, salmon, tuna and thee most delicious sushi we've had in a long time. For those who need to start with brekkie, brunch also includes some of the staples like a cooked breakfast of eggs benedict, omlettes, pancakes, bacon, sausage and more. For once I decided to decline these and make space for the lunch options and I'm so glad I did. With the most quality ingredients, there was succulent roast lamb, tender roast beef and soft salmon filo, yuca fries and mojo verde, alongside a variety of interesting and unique veggie sides. For those looking for more of an asian twist there was beef pot stickers and veggie pot stickers and scrummy sweet and spicy dips to go with them. The cold options were just as fresh and delicious and not overlooked by me (for once!). I sampled the roasted artichoke and veggie salad and the beetroot, arugula, gorgonzola and walnut salad that were both delicious! With one of the most talented pastry chefs on island, the dessert section at the Ritz is worth saving space for! Besides being almost too beautiful to eat, there was a variety of different individual portions set to delight. 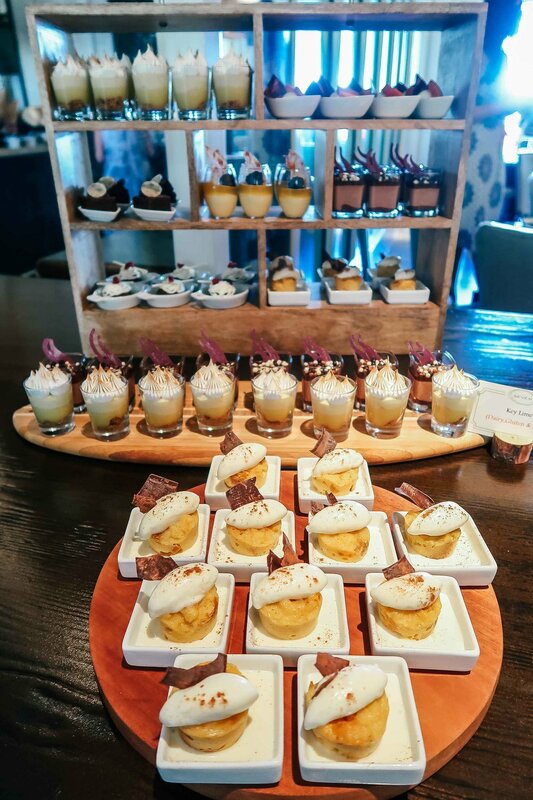 Think mini key lime pies, white chocolate raspberry, chocolate brownies and so much more including a decent array of cheeses to really finish you off! After almost three hours of eating and drinking, freshly brewed coffees are offered to pep you up and get you on your way! If you're looking to enjoy a totally decadent, luxurious, memorable and sophisticated brunch with loved ones, I cant recommend the Seven brunch enough. Each Ritz brunch will have the impeccable high standard but will come with its own exciting new treats. It's certainly worth celebrating as an experience to savour and a brunch worth waiting for. Thank you to the Ritz Carlton - what a truly wonderful gift!